Subject: LongIsland.com - Your Name sent you Event details of "Showcase Cinemas Presents: “Josh Groban Bridges from Madison Square Garden”"
The world’s most unmistakable voice returns to the big screen when “Josh Groban Bridges Madison Square Garden” comes to select cinemas nationwide for a spectacular one-night concert event on Tuesday, February 12. 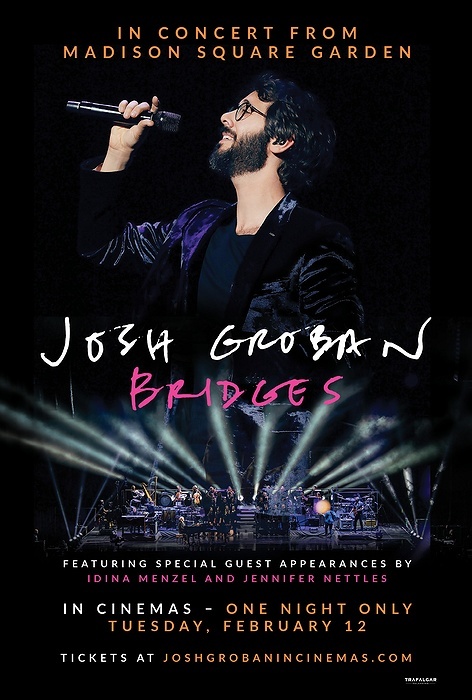 Recorded live from the final US stop of his 2018 Bridges Tour at the famed Madison Square Garden, the multi-platinum award-winning singer is joined by Tony-Award winning, multi-platinum recording artist, Idina Menzel for two captivating duets along with a special appearance by Sugarland’s Jennifer Nettles. Backed by a 14-piece orchestra and a 5-member band, Josh Groban’s buttery baritone shines throughout in an electrifying mix of beloved classics, new songs and special covers. An artist known for engaging with his audiences and connecting with his fans, Josh Groban has also recorded an introduction exclusively for this cinema event, providing additional insight around what made this the must-see performance of a lifetime. Showcase Cinemas Concerts are an Event Cinema series celebrating some of the world’s most famous and talented artists by showcasing them in live concerts fit for the big screen. Reserve your tickets now to see “Josh Groban Bridges Madison Square Garden” at a Showcase Cinema theatre near you.